Jane Patrick (right) has been helping her son with his student loan debt, and her roommate, Annette Pelaez, is still paying off debt from her college years. In some ways, roommates Annette Pelaez and Jane Patrick are like millions of other Americans who are buckling under the weight of student loan debt. 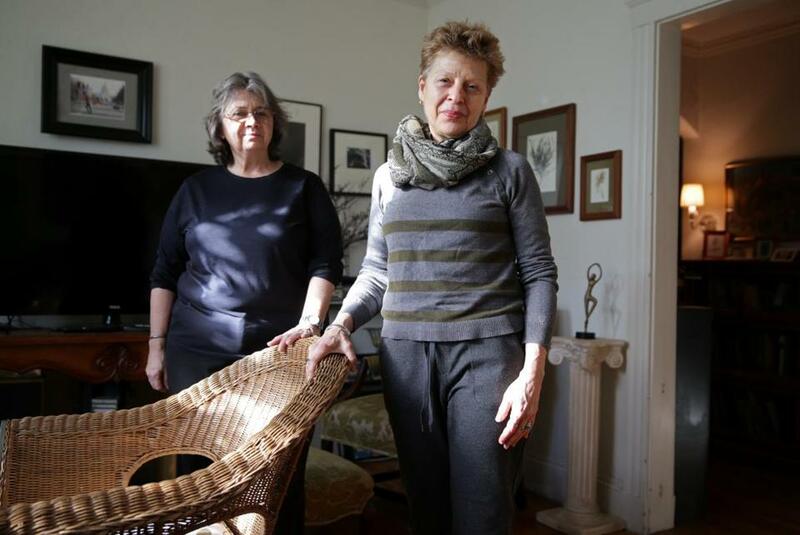 They split the expenses on a tiny two-bedroom Brookline apartment to save money. They worry about job stability. They wonder if their futures will have to be put on hold because of the tens of thousands of dollars they owe in college costs. But Pelaez and Patrick aren’t fresh-faced graduates or even millennials. Both 63 years old, they are among the fastest-growing segment of borrowers burdened by student loans: Americans over age 60. “I thought I would have paid them off a long time ago,” said Pelaez, who would like to retire in the next few years from her elder care job but owes $37,000 dating to the 1990s, when she returned to school to get master’s and doctoral degrees. She said she doesn’t regret getting her American studies and filmmaking degrees, but living like a recent college grad all these years later has been tough. While policy makers and academics have focused on the plight of young borrowers who have been forced to move back in with their parents or delayed such financial milestones as buying their first home, older borrowers face their own set of unique challenges. Paying down debt can quickly eat into retirement savings, and borrowers who end up defaulting on loans risk losing some of their Social Security income. In 2015, the federal government took a portion of the Social Security payments of 114,000 borrowers over age 50 because they had defaulted on student loans, according to a December report from the Government Accountability Office. Four out of five had their loans for 10 years or longer. Patrick, Pelaez’s roommate, owes $50,000 on student loans. Her debt is more recent than Pelaez’s — she borrowed to help pay for her son’s education at Boston University after he tapped out his financial aid. People 18 to 39 still make up the vast majority of student loan borrowers, but since 2005 the number of consumers over 60 with outstanding college debt has quadrupled, to 2.8 million from 700,000. In 2015, they accounted for an estimated $66.7 billion of the $1.2 trillion outstanding in student loans, according to the Consumer Financial Protection Bureau. Their ranks probably will continue to swell, a residual effect of the financial crisis. The economy’s 2008 collapse pushed more middle-age adults to go back to school in not-always-realized hopes of improving their job prospects. The additional borrowing, relatively late in life, virtually guarantees that many will carry school debt deep into retirement. On top of that, older consumers are borrowing money to ensure that their children and grandchildren earn degrees. That has spread the financial burden of attending college across multiple generations, student loan experts said. According to a 2014 Federal Reserve survey, more than 70 percent of older borrowers are paying off debt for a child or a grandchild’s education. Some of the borrowing comes through the Parent PLUS federal loan program, originally created to let parents borrow so they could fill small gaps in funding when student aid fell short but which has now ballooned to $78 billion. Even in just the last two years those loans, which aren’t based on a parent’s ability to pay them off, have grown by about $13 billion. Susan, 71, of Easthampton, is among those borrowers. Her wages have been garnished to pay off a federal student loan. She says collectors have also threatened to take a portion of her Social Security check. The outpatient therapist — who asked that her last name not be published because she doesn’t want her clients and colleagues to know about her finances — took out a $30,000 student loan in the 1990s to get her master’s degree in social work. The diploma got her a job she loved, but her salary never topped $45,000. Her loan balance has since exploded to about $185,000 as interest and collection fees pile up — including from defaults when she couldn’t make monthly payments because she needed money to buy a car or pay rent. Susan said she recently worked out an income-based repayment option with the lender that will put a stop to the garnishments, but she expects to be paying off her loan debt until she’s 96. Adam Minsky, a Boston attorney who specializes in student loan issues, said he is advising more older clients who are weighed down by debt — either for their own education or for family members. They’ve taken on these loans out of love or necessity, Minsky said, but now they’re being forced to make difficult choices about retirement or paying for medical expenses. Unlike younger borrowers who expect their wages to climb in the years after graduation, older debtors face flattening or declining incomes. Health issues can exacerbate financial pressures by limiting their ability to keep working.